“Rabbitat” -yesterday, today & tomorrow! Someone recently told me that he was upset with the fact that the “Base License” in Michigan’s hunting license process now forces him in reality to purchase a small game license when his only real outdoor interest is deer hunting. He clearly felt he was being forced, in a manner of speaking, to purchase something entirely useless in his regard. My response to him was to go small game hunting and get his money’s worth because he didn’t know what he was missing. Personally I don’t have a problem with the Base License issue and it just might be an incentive to get more folks involved in small game hunting, which in recent years has seen a loss in numbers per hunter participation (deer hunters in Michigan now outnumber small game hunters almost three to one). I do dearly love small game hunting and my winters would never be the same without the presence of the cottontail rabbit in my home Thumb area. Growing up on a Thumb area farm (and still living there) I have a long association with the cottontail rabbit, a wild critter that I much admire, and it was the first game animal that I ever harvested. This occurred when I was a kid and had just finished my morning chores at the barn and was returning to our farmhouse. When I walked past the corncrib a cottontail flushed from near it and headed lickety-split to our orchard nearby. I went to house and obtained permission from my mother to hunt the rabbit down and grabbed up my single-shot .410 shotgun that had once belonged to my grandfather, and a couple of (paper in those days) shells. A fresh, fluffy snow had just fallen during the night and it didn’t take me long to locate and get on the fresh rabbit tracks that made a meandering course through the orchard, and for me to sort matters out. The tracks ended at a pile of snow-covered, pruned apple tree branches, and I held the .410 at port-arms and gave the pile an abrupt kick. The rabbit suddenly flew out like an airborne jack-in-the-box and hit the ground and was airborne again in a mighty leap when the .410 barked almost of its own accord and the headshot rabbit dropped on the spot. Everything on my shooting part had been purely instinctive, and maybe it was simply a lucky shot. Just the same I was forever after a smitten rabbit hunter and I have used that particular tracking technique for rabbit hunting after a fresh snow ever since. My mother would soon after this memorable moment direct me on how to properly process a rabbit for the table (in her words -“you shot it – you cut it up – and learn to do it right”). Rabbit meat is actually very fat-free but when you dip and heavily coat it in spiced pancake batter and deep-fry it, it kind of defeats the fat-free purpose. Despite this fact, it is one of my favorite rabbit recipes (which there are many – cottontails are extremely good and delicious eating). In time I would be introduced by friends to pursuing rabbits with hounds (most notably beagles), a very time honored pastime and I have ever since owned beagles for the purpose (although I use them for pheasant hunting as well – beagles are a very versatile and infectiously happy breed that vocally refuse to be left behind whenever my Brittany “bird-dogs” are turned out of my kennel). There is nothing quite as unique as listening to beagles singing in chorus on a hot rabbit track during a wintry atmosphere. If you have never witnessed this melodious moment, you are truly missing out on one of the most exhilarating experiences in the outdoors. Hounds baying on track have a way of drawing your soul into the hunt, and it is an association as ancient as the relationship of humans with dogs. Maybe you will bag the quarry, and maybe not, but it is the close and very personal bond shared with your canine hunting partners in the field that truly matters in the end. Whenever I decide to add a lot of rabbits to the pot, so to speak, I perform a well-organized rabbit-drive, also an ancient hunting technique as old as humans being hunters. The real key here is in knowing your ground, which in this case I always refer to as being “rabbitat” (and it can be nastily dense and snarly cover). Standers need to be placed at pinch-points and in obvious funnels towards known places of refuge for hunter-wise cottontails. Drivers then move through the cover in an organized manner that shakes the highly wary cottontails loose and on the move (hopefully in the right direction). In this case I prefer to use dogs as well, and any flushing breed will work, such as my Labrador retriever and rat terrier. My two beagles of course never wanting to be left behind, have learned to know the difference between an organized rabbit drive and when they can be , well, typical beagles (they also know when they are “bird-dogs” – beagles are a very unique breed). While this may sound unusual if not impossible to some, it is a system I have worked out with my pooches. And of course I am one of the pooches too, as I dearly love working with my dogs and driving rabbits to the waiting standers. Hearing gunfire is definitely music to my ears, and despite who does the shooting, it is a teamwork effort shared by all, and I do love to eat rabbit, a very distinct wintertime flavor for me. 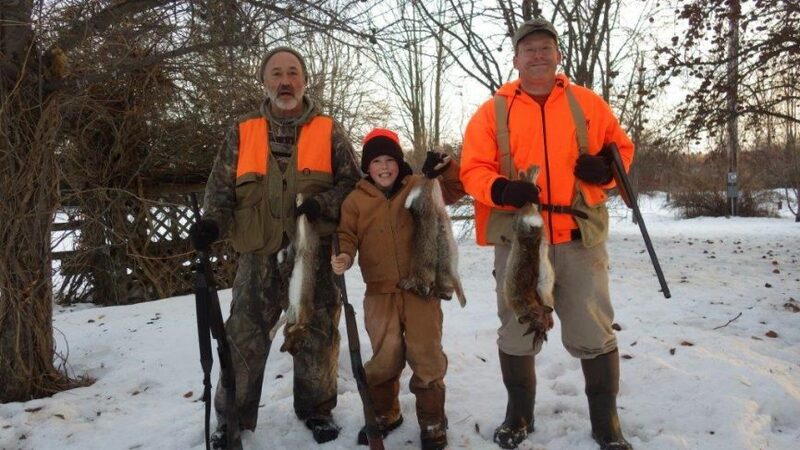 Wherever you live in Michigan, you are never far from true “rabbitat”. Learn to recognize and take advantage of it and doing so will certainly shorten up long winters and add some great outdoor adventures to boot. 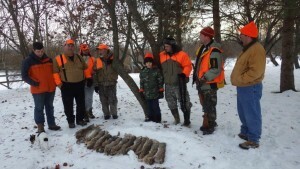 …btw…the featured pic shows a family of three generations of hunters.